In the late 1950’s and early 1960’s, the League of Women Voters and other citizen groups supported the formation of the Municipality of Metropolitan Seattle (Metro) to build a regional sewage treatment facility at West Point on Fort Lawton. The plant was dedicated in 1966. The City of Seattle, like many other large municipalities located on salt water, had a “marine waiver” that allowed discharge of primary-treated sewage into marine waters, thus avoiding the costs of secondary treatment. However, the national attitude and the national laws were changing to favor clean water and environmental protection. The Clean Water Act was passed in 1972 and amended in 1977 and 1981, but still had the “marine waiver.” By 1981 the pressure was building to do away with the marine waiver and to require secondary treatment at all treatment plants. The Puget Sound Water Quality Defense Fund (PSWQDF) was created to fight for secondary treatment at West Point, but they were also dead set against expanding the Discovery Park site. The battle over the location of the secondary treatment plant raged for nearly a decade. PSWQDF appealed Metro’s plan for secondary treatment at West Point to the Shoreline Management Hearings Board and lost. They then appealed to Superior Court and lost again. PSWQDF was preparing another appeal when Metro initiated settlement talks. In 1991 both sides signed an agreement including strict environmental provisions to protect Discovery Park. As a result, the secondary treatment could not expand any further than what was already built. The footprint, the height, but also the “pollutant loading’ (the amount of pollutants contained in the discharge of storm water or treated sewage) were fixed at their current dimensions. 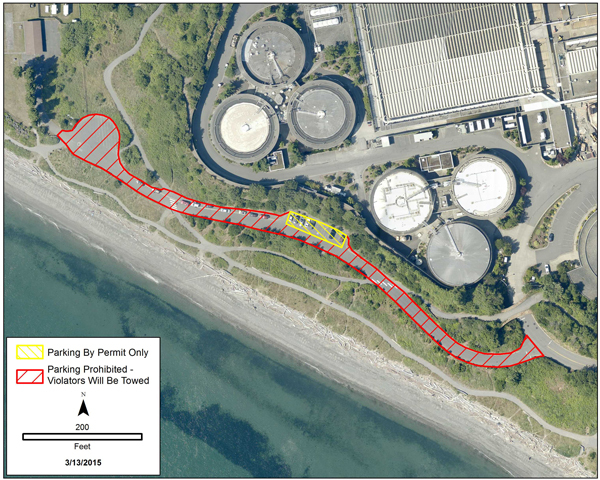 The settlement agreement also provided that if a better process for solids handling was found, and they could eliminate one, two, or three of the digesters, then they would take the ones down that were closest to the beach and let that become a public use area. If Metro did not find a better way to handle the solids, then they had to pay the City of Seattle one million dollars per acre. In the end, Metro did not find a better way, and they did pay the money into a trust account for improvements to Discovery Park. The secondary treatment expansion was completed in 1996. But by 1999 Seattle and King County needed to expand their secondary treatment facilities. The Citizens Advisory Committee representing the PSWQDF, The Washington Environmental Council, Legal Advocates of Washington, Magnolia Community Club, and Friends of Discovery Park opposed any expansion at West Point. They invoked the special environmental provisions in the 1991 agreement, specifically the prohibition against additional pollutant loading. The provisions held up legally, and in 2003 King County Metro chose a 114-acre site in Snohomish County for the new Brightwater facility which began operation in 2011. County to continue enforcing no-parking rules in emergency areas outside West Point Treatment Plant. Cars parked illegally will be towed at owner’s expense.